(1) KEPLER STRAIGHTENS UP AND FLIES RIGHT. NASA reports that the Kepler spacecraft has been stabilized and is no longer wasting fuel. They won’t resume science operations until they think they know what went wrong. (2) GALAKTIKA PIRACY. Author Malcolm F. Cross discusses what it feels like to discover his story was swiped by Hungary’s Galaktika magazine. My short story, Pavlov’s House, which was both my first pro-sale and something I wrote as part of the early work on figuring out Dog Country, was ripped off by Galaktika. What is Galaktika? It’s a Hungarian SFF magazine, which has over the past few years apparently ripped off a lot of authors. (There are some articles by A.G. Carpenter on the issue here: here) They went ahead and translated it into Magyar/Hungarian, then sold it in print, without asking me for translation rights, without notifying me, without offering me a contract or payment. They stole my story. Getting my head around that has been kind of traumatic for me. My writing career is one of the most important things I have in my life, and part of that career is having a say in where and how my work appears. Stories are part of a conversation, by submitting my fiction for publication, by trying to sell it, by getting involved in where and how it appears, I am adding to that conversation. But when I get ripped off…? I’m not sure I’m part of that conversation anymore, and that’s been bugging me immensely. For now I’m in touch with SFWA (I’m a member, if you did not know!) and figuring out what I can/should do about it. In the meanwhile, though, if you haven’t already, go enjoy Pavlov’s House where it was originally published, at Strange Horizons, over here…. (3) BURNSIDE ON WEIGHING CREDIBILITY. At Medium, Ken Burnside takes issue with those skeptical about the sexism and assaults reported by women gamers, in “For Good Men To See Nothing”. I specifically AM addressing this piece to the people of “my tribe”: white, heterosexual male gamers who wouldn’t dream of grabbing anyone in a non-consensual or sexual way in public, and find descriptions of these kinds of acts inconceivable, because they don’t happen in front of us. Our starting point is an article by Emily Garland, who won a judgment from a Canadian court about entrenched sexism she experienced as a customer at a game store. It’s the “Tabletop Gaming Has a White Male Terrorism Problem” piece that came to public notice in early April 2016. To our credit as human beings, it’s gotten a lot of positive responses?—?positive in the sense of “Yes, this is believable, and we’ve got to do something about it.” However, it’s also gotten the “I think she’s making it up to get attention” backlash that’s common when discussing sexism. No, guys. She isn’t. And as long litanies and lists of licentious license being taken won’t convince you…I’m going to pose this a different way…. The people who do this are incredibly facile with a plausible explanation for why what they’re doing is “not wrong” or “normal”?—?“It’s just a joke.” “Oh, she left something with me and I needed to return it to her.” They know that the vast majority of good men (like you, the people I’m writing this to) will accept that kind of explanation rather than act on it. A friend of mine, New York Times bestselling author Steven Barnes, has a term for these kinds of people: “Smiling monsters.” They’ll smile and be cheerful to your face when you confront them, and expect you to forget them entirely while they go back to whatever it was you caught them at. These people rely on two facts: The first is that their victim doesn’t want to trigger a confrontation: even bold, brave women like the cosplayer I befriended at Sasquan get jittery about direct confrontation. The second is that good men, like you, won’t believe they’re doing what they’re doing, because they can’t imagine doing it. It’s easy to overlook smiling monsters when they give a glib answer and scuttle out of sight. When you accept the explanation of the smiling monster, you give the victim the impression that you won’t listen to what they have to say. The smiling monster is betting on that, and 99% of the time, he’s right…. (4) A SPECULATIVE REVIEW. From Stephenie Sheung, “Review: Almost Infamous by Matt Carter” at The Speculative Herald. If you’re a fan of comics and are looking for a clever, humorous, and merciless riff on the superhero genre, then Almost Infamous is most definitely the book for you! Matt Carter’s novel is a wildly entertaining, satirical take on the characters and worlds we imagine when we picture the Marvel or DC universes, and as a twist, his protagonist is a horny, uppity teenage supervillain. To get a sense of the zaniness you’re in for, just take a peek at the book’s first few pages, featuring a “Brief History of Superheroes.” Super powers—whether you were born with them, cursed with them, granted them as a result of radioactive freak accident, changed by a gene-splicing experiment gone wrong, and so on and so forth—are just a common fact of life. Superhumans are real. Oh, and by the way, so are Atlanteans, Lemurians, magicians, aliens, demons, golems, mortal gods who walk the earth, and pretty much every kind of power-endowed beings you can think of. All real. (5) A BRIEF HISTORY OF FANFIC. Andrew Liptak explores “Unauthorized Stories: Fan Fiction and Fandom” at Kirkus Reviews. Looking at the phenomenon, Fan Fiction is a wholly new type of medium that arrived because of the close-knit genre communities, and it demonstrates the unique environment of these communities. They’re also coupled with the rise of larger media franchises that typically expand far beyond the reach of novels. Fan fiction has provided a unique opportunity for fans to push the boundaries of the stories that they’ve come to love, and contribute to it in their own ways. (6) HOPPING. In part 8 of Black Gate’s Choosing Your Narrative Point of View Series, Tina Jens reveals “Things Your Writing Teacher Never Told You: The Multiple Personalities of Omniscient 3rd Person: Spotlight on ‘Head-Hopper’”, at Black Gate. If you’ve not read her novel, I urge you to do so. I also urge you to read it aloud, even if you’re sitting outside at a café, which I did a few summers ago. The book is graced with many long, complex sentences that loop and flow, and sometimes change point of view from one clause to the next. Reading it out loud helps the brain make sense of the phrases and clauses in a way that eyes-only reading can’t manage as well. When done well, as Ms. Woolf did, it is a brilliant writing stratagem. But it works best in stories where there is very little physical plot. The conflict comes mainly from the contrast of how different characters perceive the same moment, and in the shifting emotions of characters. Which means, generally, it is not a good point of view choice for action-packed genre stories. (7) ISLAMIC SF CONTEST. 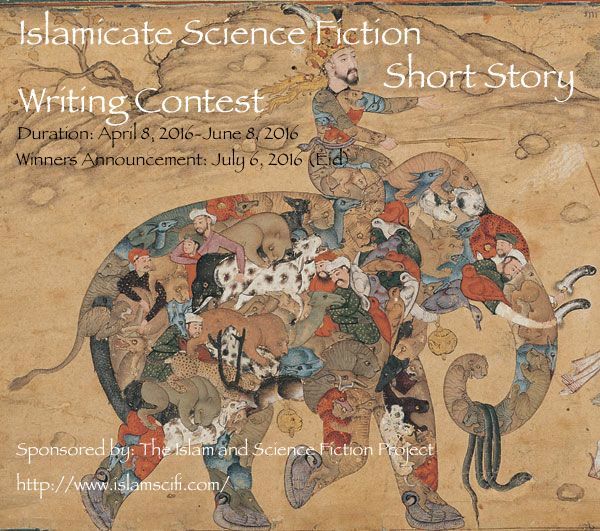 The Islamicate Science Fiction short story writing contest is open and will accept submissions until to the beginning of Ramadan/Ramzan/Ramjan (June 8, 2016). The winner will be announced on the day of Eid – July 6, 2016. Cash prizes will be given to the first, second and third place stories. The Islam and Science Fiction project has been running since 2005, we just entered our second decade. While the depiction of Muslims in Science Fiction and Islamic cultures has improved we still have a lot way to go, as is the case with many other minority groups. To kickstart things in this genre we have decided to start a contest centered around Science Fiction with Muslim characters or Islamic cultures (Islam in the cultural sense and not necessarily in the religious sense)…. (8) A KITTEN’S PERSPECTIVE. “Happy Kittens Smile Back” at Spacefaring, Extradimensional Happy Kittens. Whew, Hugo nominations have closed and I managed to actually consume enough good SFF to nominate five things in most categories. The extraordinary new resources like Rocket Stack Rank and various longlists really came in handy. Of course, the Hugo nomination deadline is just an excuse. Discovering new writers and fanzines you hadn’t heard of before is the thing, not some weird, phallic awards that never (or very very seldom) are given to your absolute top favorites anyway. I do like the fan community aspect of it — people reading the shortlisted works at the same time and discussing them, and getting together to throw the annual party — but it’s all more or less sideshow. The books, the stories and the other exciting things are what it’s about for me. (9) LOCUS AWARDS DEADLINE. Voting closes April 15. (10) SF AUTHORS WRITE BREAKFAST STORIES. By gifting some virtual birthday waffles to Sarah Pinsker, A. C. Wise started a breakfast meme on Twitter. @ac_wise @asymbina @SarahPinsker @andreapawley Journal of Unlikely Waffles: the next Unlikely Story issue! @asymbina @SarahPinsker @Wiswell @KMSzpara @andreapawley The Ones Who Walk Away from Omelets. And lots more where those came from…. (11) WE ARE IN KANSAS TOTO. What happens when you are accidentally assigned 600 million IP addresses? Learn about “How an internet mapping glitch turned a random Kansas farm into a digital hell” at Fusion. For the last decade, Taylor and her renters have been visited by all kinds of mysterious trouble. They’ve been accused of being identity thieves, spammers, scammers and fraudsters. They’ve gotten visited by FBI agents, federal marshals, IRS collectors, ambulances searching for suicidal veterans, and police officers searching for runaway children. They’ve found people scrounging around in their barn. The renters have been doxxed, their names and addresses posted on the internet by vigilantes. Once, someone left a broken toilet in the driveway as a strange, indefinite threat…. The trouble for the Taylor farm started in 2002, when a Massachusetts-based digital mapping company called MaxMind decided it wanted to provide “IP intelligence” to companies who wanted to know the geographic location of a computer to, for example, show the person using it relevant ads or to send the person a warning letter if they were pirating music or movies. There are lots of different ways a company like MaxMind can try to figure out where an IP address is located. It can “war-drive,” sending cars around the U.S. looking for open wifi networks, getting those networks’ IP addresses, and recording their physical locations. It can gather information via apps on smartphones that note the GPS coordinates of the phone when it takes on a new IP address. It can look at which company owns an IP address, and then make an assumption that the IP address is linked to that company’s office. (12) HANNA BARBERA. See the photos at Fred Seibert’s Tumblr, “Hanna & Barbera, the last portraits. By Jeff Sedlik”. Without knowing it, Bill Hanna and Joe Barbera presented me with the reasons I got into the cartoon business in 1992. Looney Tunes, Popeye the Sailor, Tom and Jerry and Crusader Rabbit were the first favorites in my cartoon diet, but my fandom really kicked into gear with Hanna-Barbera’s The Huckleberry Hound Show, and their first wave that ended with The Jetsons. When I started traveling to Hollywood in my 30s, whenever I passed their classic Googie studios, I would wonder what went on in that hallowed fortress. Little could I know that I’d end up as the last president of the company. One of the missions was to give some respect to Bill and Joe that I felt they’d missed over the decades when they’d disrupted the industry and vintage cartoon partisans never forgave them. They were abused as having limited creative imaginations, so I commissioned a series of essays written by Bill Burnett to set the record straight. In 1996, towards the end of my tenure (owner Ted Turner sold his entire operation to Time-Warner), I commissioned a series of formal portraits by one of my favorite Los Angeles based photographers, Jeff Sedlik. Bill was 86, Joe 85, and they deserved to be remembered as the American cultural titans that they were. (13) NEW SUICIDE SQUAD TRAILER. Aired during the MTV Movie Awards.